In our showroom you can find a large range of contemporary hotel furniture including hotel dining furniture. There’s a big collection of tables, chairs, stools and other furniture for hotels. The biggest advantage of our hotel contract furniture is its reliable quality. If you’re thinking about where to buy hotel furniture, visit our showroom and our team will help you choose your perfect set of hotel restaurant furniture. If you are an owner of a restaurant or hotel business, we can provide you with high quality outdoor bar stools and outdoor bar loungers. Our products are resistant to the tough climate conditions of the Middle East and they look really beautiful and stylish. They are made of fine, solid materials, so if you buy outdoor bar seating at Parasol International, you can be sure that they will serve you well for at least five years. For extra peace of mind, they also come with warranties. 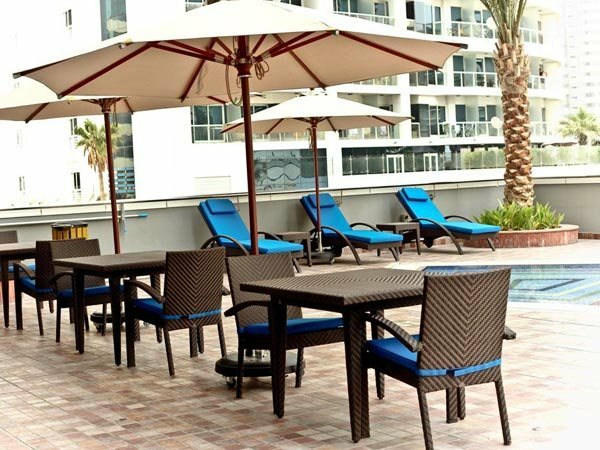 We offer an extensive collection of outdoor bar furniture that you can see in our showroom located in the centre of Dubai, near the Mall of Emirates. There’s a huge choice of outdoor tables, stools, umbrellas and lounges all at affordable prices. Parasol Garden furniture provides a large range of pool furniture products like chairs, stools, umbrellas, pool tables. They all have beautiful and stylish design and they can definitely become an important part of your exterior space. If you hesitate about your choice, you can always take advantage of our exclusive service of trial period which is absolutely free, by the way. Using our trial period you can understand better if a furniture piece looks good or not in your garden. When you’ve chosen the right furniture product, we can deliver it on the same day, so you don’t have to wait for a long time. Our products of outdoor beach furniture range aren’t only top quality, but they are really stylish and can become a real embellishment for your pool or wherever you want to place them. If you are having any doubts about buying a beach umbrella, for example, you can use our trial period which is absolutely free. With our trial period you can understand better whether a furniture product fits or not into your space. Once you’ve chosen your product, we can deliver it on the same day, so you don’t have to wait for days or weeks. If you are having hard times deciding, we can always help you sharing our beach furniture ideas – we have a great experience in outdoor furniture design.